Bam, that was it, I was sold. I decided that as long as I hit those goals, I would call it a success and try this again later in the year. I knew going into it that it wasn’t going to be perfect the first time. But hey, this is new for me. Also, this is Algebra 2 Honors. I figured I couldn’t mess them up too bad at this point. This was kind of a review for them. First, we did our regular, beginning of class bellwork. I love me some bellwork. Then, I put this picture on the board and didn’t say a word. Also, this class period is right before lunch :) The class was almost silent during bellwork. The class erupted. We has a quick discussion about how we’re hungry. 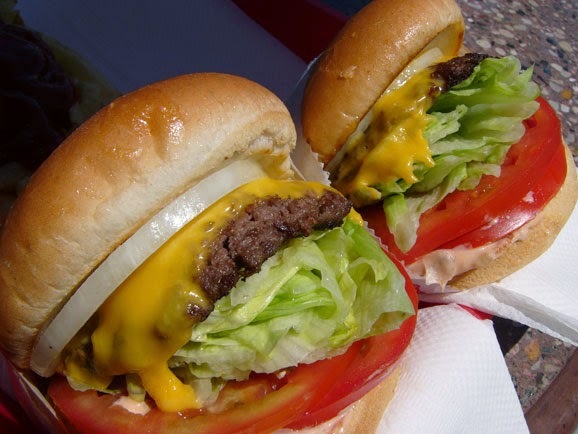 Then, I showed the picture of the Double-Double cheeseburger. When I showed them the picture of the 100x100 cheeseburger they started throwing out all kinds of great questions. The question “How much does that thing cost?” came up quickly. I made them give me an estimate that they knew was too low, and an estimate that they knew was too high. 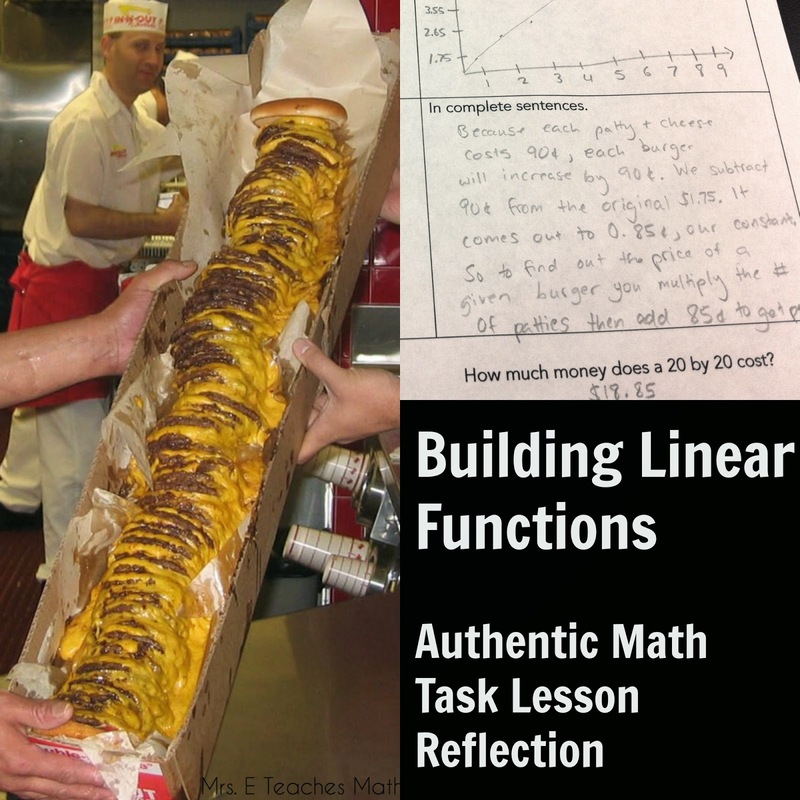 I handed out student answer sheets and displayed the picture of the menu and prices. I told them that they had to find out how much the 100x100 cost, but then they could also answer any other question they thought of. They worked in partners. After I gave the directions and let them work a few minutes, I realized that I was a little too vague. 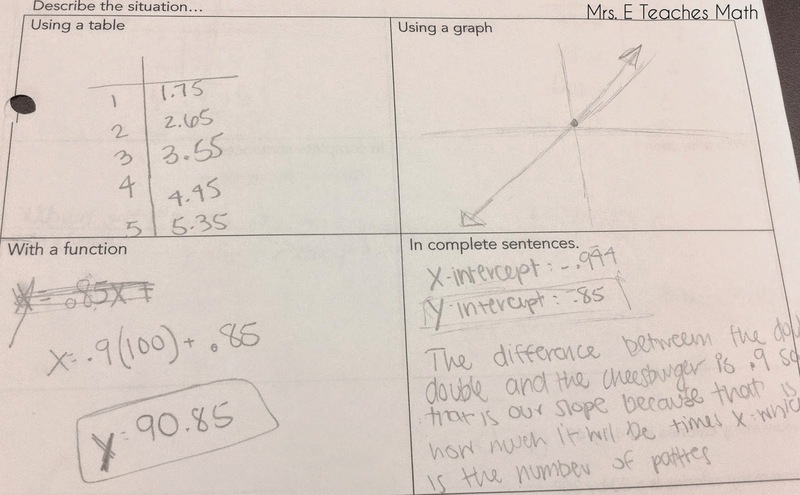 We looked at the answer sheet together and I explained that I wanted them to come up with a function and represent it in four different ways. It was interesting to me to watch them work. 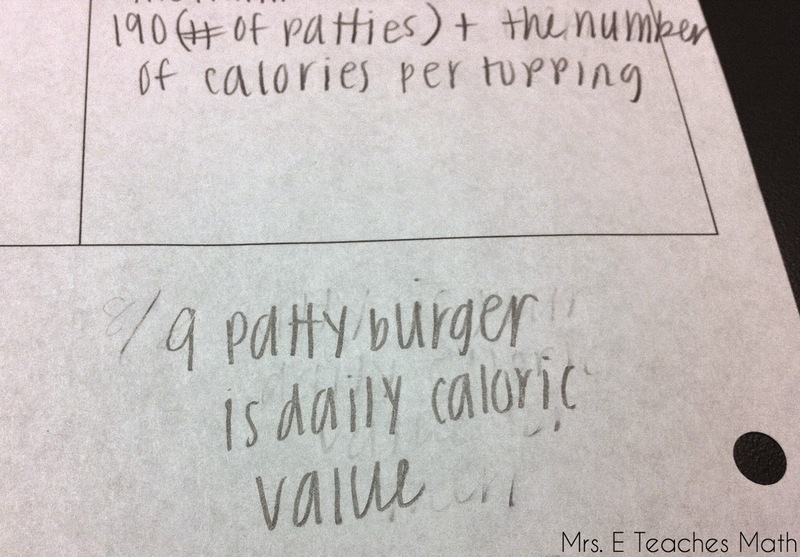 Every single one of my groups wrote their equation as cost = 0.9(# of patties) + 0.85 I expected some of the groups to use the cost of the Double-Double and some to use the cost of the single cheeseburger. They weren’t copying off of each other either. When all of the groups figured out the cost, I showed them the picture of the receipt. I didn’t expect it to be a big deal, but there was a huge jackpot payoff for them to see the actual receipt. I didn’t realize it before I used it in class, but there needs to be some sort of payoff for their work. Then, I let them choose another question and answer it themselves. Most of the kids asked something based off of the number of calories. My favorite was “If no one could eat more than 2,000 calories, how many people would it take to eat all of that?” Another group found out how many patties they could eat to fit within their daily calorie allowance. I totally forgot to do some type of summary before the bell rang. I only teach one section of this class, so I didn’t get a chance to do better the next class period. My kids were really excited about this. Crazy excited. However, I think that I need to be careful and reel them in a little next time. It’s only September; I’m nervous to see what crazy excited looks like in April. They worked hard and talked math the whole period, but I want to keep a tighter ship next time. I’m glad I practiced with a review type lesson before I jumped into something that was new material for them. Now, I know a little more what to expect and how to guide them when I do use more tasks in the future. Their biggest hurdle was getting started. Having a loose framework for them (like an answer sheet) is essential, in my opinion. It helps them sort their thoughts. Some kids worked much faster than others (duh!). This was great because I could just say, “Great, what else can you tell me?” and they could work on another question. However, I think I need to provide a little more guidance to the struggling groups next time. I had my students work in partners. Next time, I’ll have them work in groups of four. They need more discussion. I plan to do a few more of these types of lessons this year. There are so many great things going on here that I don't know where to begin. I also find it interesting that they all used .9x + .85. 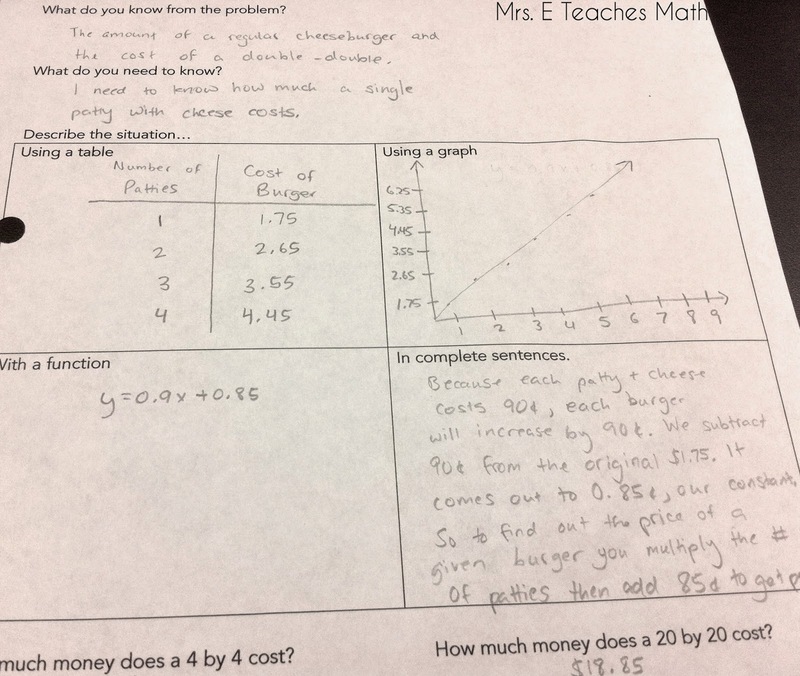 Perhaps you can ask them how their equation compares to the way the burger was listed on the receipt, then follow it up with asking them to write an equation that matches the receipt. I completely agree about the magic of the payoff. It still amazes me how happy everyone gets when they see the receipt. It wouldn't be a bad lesson without it, but it goes from good to great. Regarding their excitement, facilitating these types of lessons are definitely exercises in "loose / tight" teaching. It doesn't sound like they were too loose to me. Think about all the math they learned, talked about, and loved because of you. FYI, there are other frameworks to consider if you want. I have one, Matt Owen has one, Andrew Stadel has one, and the Math Forum at Drexel has one too. It is great to have extension questions ready in case groups finish early. I like, what is the biggest burger you could get for $###? All in all, fantastic job for your first attempt. 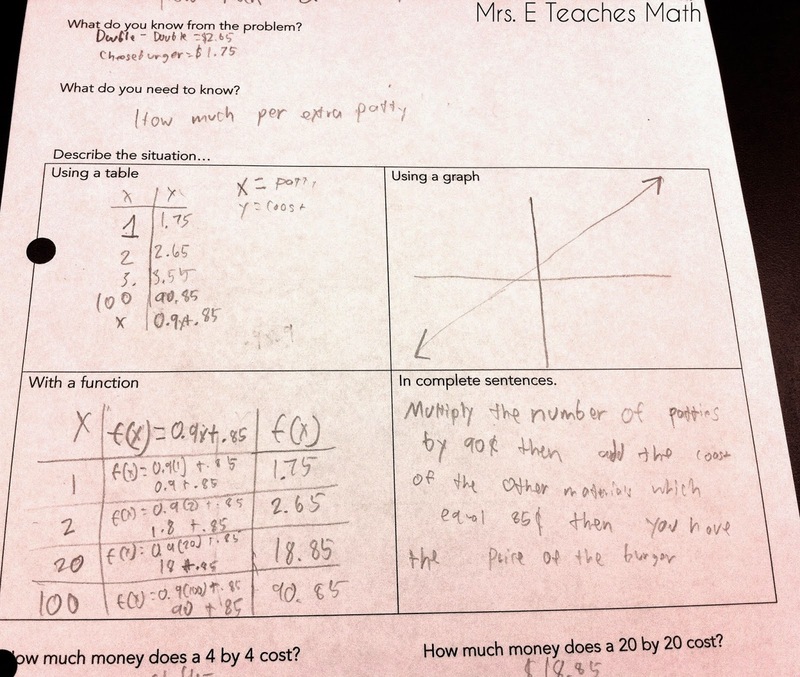 Asking them to write another equation to match the receipt is such a good idea! I didn't think of that. Now, thinking back, I kept saying "So, we took the same bun and toppings, and added the patties and cheese..." I was saying it this way to point out that we weren't adding more buns every time, but I bet it influenced their equations. I guess I was just out of my comfort zone, letting the kids talk so much in class. I'm a pretty quiet person. Even when my kids work together, they tend to be pretty quiet too. However, during this lesson, the whole class period was a a dull roar. There were a couple of times that I actually thought to myself, "They're working on math, don't quiet them down, they're fine, they're fine." I think, out of everything, this is the biggest adjustment for me. Learning doesn't have to be quiet. Sometimes, learning is exciting and loud. Thanks for taking the time to read this and leave a comment. 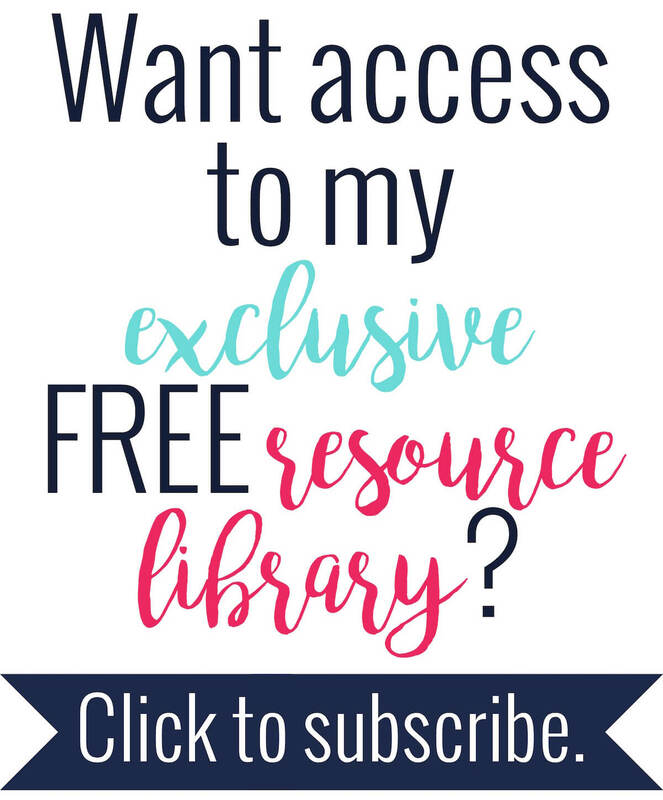 It was very encouraging for me to read! Thanks for typing up your experience! Very useful.